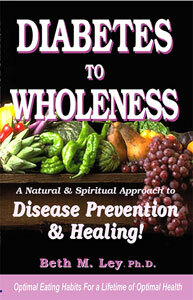 Diabetes to Wholeness: A Natural & Spiritual Approach to Disease Prevention & Healing! Diabetes is the third leading cause of death in the U.S. It also inflicts serious suffering in the form of blindness, nerve damage, heart disease, stroke, circulatory problems, gangrene and loss of limbs. In just 25 years, the incidence of diabetes has increased over 600%, accounting for over 300,000 (mostly preventable) deaths each year. The early warning signs of glucose intolerance and Syndrome X - a Type II diabetes precursor. What the Word of God has to say about issues you need to examine in your life to obtain and maintain wholeness and optimum health.